Beaming Baby monthly value packs save you money, time and hassle, with next day delivery straight to your door. Whats so good about them? * They use 30% less chemicals than standard disposable nappies, dramatically reducing the chances of nappy rash and are kind to all babies; especially those with eczema or sensitive skin. * Better for the planet; every nappy is 40% more biodegradable than standard disposable nappies. In total, they are 65% biodegradable (including the packaging)- one of the highest percentages on the market. Most of the nappy biodegrades within 4 years instead of the mind blowing 400 years that standard nappies are estimated to take! *Compare these prices per nappy to the mainstream supermarket bought nappies and you will see there is very little difference in price! The top sheet is biodegradable, water resistant and made with natural cotton and cornstarch fibres. The absorbent layer is fortified with 100% natural cornstarch. The packaging is bio-degradable to further reduce the impact on the environment. They are gently infused with aromatherapy oils including chamomile and ylang-ylang to help protect baby’s sensitive skin and release a gentle scent. They form a naturally breathable layer against your baby’s skin. "I was lucky enough to try some of Beaming Baby's new nappies during their development. My baby was really comfortable, they feel breathable to touch. A great nappy - welldone Beaming Baby!" 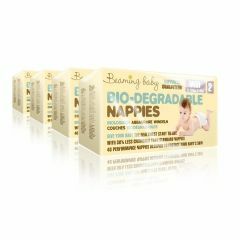 We have used Beaming Baby Eco nappies on both our children and I can't recommend them enough. It gives me peace of mind knowing that we are being environmentally friendly especially with the amount of nappies that we go through. Our baby is sleeping 12 hrs a night for us now and she always wakes up dry. They have never caused a rash and there is no smell when they are wet (unlike with other branded nappies). Buying in bulk is also very good value and Siobhan is very reliable and a total pleasure to deal with. I'd have more children just to be able to continue using these nappies!! Thank you Siobhan for making these available to us and for the continued fantastic service. Been using these for over 3 months and have found them great. No rashes, no leaks, less chemicals, all good! Service is fantastic aswell. Quick delivery and a very personal service. Happy customer. I love Beaming Baby nappies, partly because they are biodegradable and I know they'll break down quicker than regular ones, and partly because they are so much less chemical-filled than supermarket nappies. They are definitely gentler on my baby's skin and even the smell of them (when new!) is so much less potent than other brands. The bulk buy are good value and the delivery is always very prompt. We switched from Pampers to Beaming Babies after our baby developed a really bad rash. Within a week of using these nappies the rash was gone. They really are wonderful. They are just as absorbent as a supermarket nappy and they keep our baby happy through the night. I also like the fact that they are biodegradable, makes me feel less guilty about the gazillion nappies we go through. A word of caution though, the sizing is slightly smaller than Pampers' so if your baby is at the limit of a size bracket, I would get the size up.